Regardless of which boat you are in, The Team You Can Trust always seeks to help any way we can. So, here is a little information on filter types that might help you in making your choice. 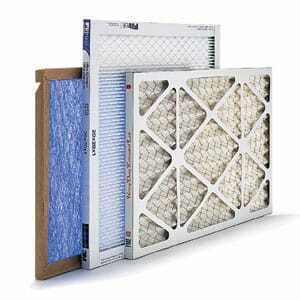 An air filter is an essential component in your system with a very crucial job. Remember that air conditioners and heat pumps are loop systems – they pump in cool or warm air through your vents. But, they cannot constantly blow air in without taking some out, so while it blows air in, the component that your filter gets inserted into, the return register, pulls the air that is already in your home back into the air handler to be reheated or chilled and recycled back into your home. As the return pulls air back in, it passes through the filter in order to purify it. The filter catches pollutants, dirt/dust, allergens, and other harmful particles, keeping your indoor air safe to breathe and dust buildup from clogging your blower or motor. Therefore, it is important to make sure you choose the best quality filter you can. That’s where we want to help you. Spun Fiberglass. These are the cheapest form of filtration. They are low MERV (1-4) and disposable. Fiberglass filters will catch up to 80% of particles 50 microns in size or larger and roughly a quarter of particles 3-10 microns. 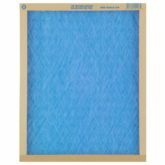 This particular type of filter is ideal for those who are renting or who don’t suffer from allergies or have pets. But, if you are a homeowner, they may not be the best of investment, as they are the bare minimum in protection and can allow smaller particles to get through to your equipment and damage it as well as cycle pollutants back into your indoor air. Disposable Pleated. Pleated filters are median (5-8) MERV and cost up to 4 times more than fiberglass. But that cost can prove to be worthwhile, as they pleats allow for more surface area for particles to pass through, meaning they catch more . These filters will collect 80-95% of particles 5 microns and up. High MERV Pleated. Due to their thickness and high rating, these MERV 11 to 13 filters cost between $45 and $100. But they will last for up to a year and work really well, trapping particles 0.3 microns and up such as bacteria and viruses. There is a catch, though. 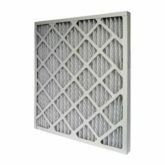 These filters are made to fit into a specifically sized housing on the air handler, and thus are only compatible with systems made for them. HEPA Filter. These are the high end of filtration. 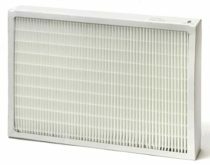 High Efficiency Particulate Air filters are thick and can drastically reduce airflow if put into a system that doesn’t support them. Like their high MERV pleated counterpart, they must be compatible with your system and filter out tiny particles and bacteria/viruses/germs. If you are new to buying filters, you will need to know the size needed. If you are unsure, measure the filter you are replacing. Measure the width, length, and thickness. For example, 16″ x 25″x 1″ is 16 inches long, 25 inches wide, and 1 inch thick. This may seem like common sense, but if you don’t know or can’t remember when the last time you changed your filter is, inspect it. Hold it up to a light source. If you cannot see the light through it, you should go ahead and replace it. Especially if you don’t even need to hold it up to light to tell it is nasty. If your system has a High MERV pleated filter, it CANNOT be replaced with a cheaper or thinner filter. Anything other than the size and type intended for the housing on your air handler will not fit and will not work. Before you remove or replace a filter, turn your system off. If you do not know how to turn it off, turn off the circuit breaker. Most manufacturers have a specific recommendation for what type of filter will work best with your equipment. You can generally look it up online. Hopefully, even if you knew what kind of filter you need or want, you have learned something from this and if you were searching for answers, you have found this blog helpful. If you have any questions about filters or have any other HVAC need, please give us a call today at (864)-578-7575!